I’m going to introduce you guys 2 latest Korean Dramas which I’m watching concurrently! The 2 Korean Drama features my favorite actor Micky Park Yoo-chun for “I Miss You” and my beloved Super Junior member Choi Siwon for “King of Dramas”. Currently broadcasting on SBS Channel every Monday & Tuesday. Already aired 4 Episodes, Total 16 Episodes. Set against the backdrop of Korean entertainment business, “The King of Dramas” revolves around the life of Anthony Kim (Kim Myung-min), a brilliant CEO of a drama production company who will do anything and everything for the sake of money, fame and success. He is known to possess the Midas touch as he has created blockbuster dramas and Hallyu stars. 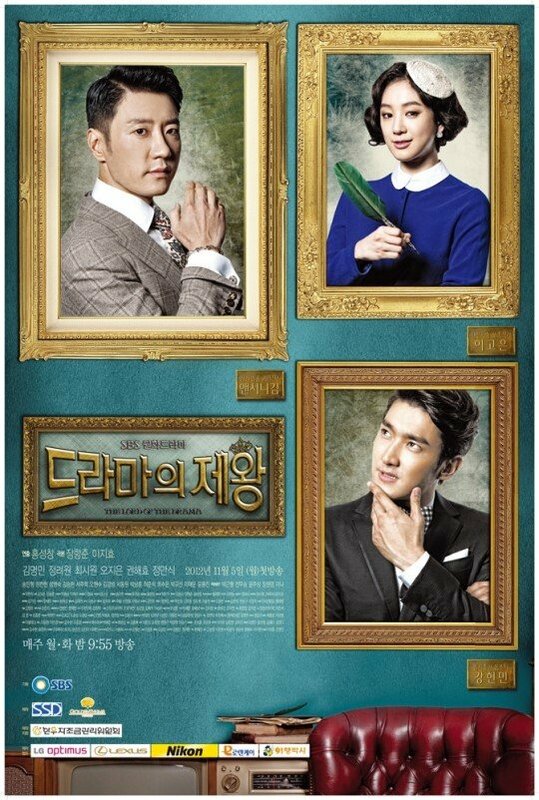 One day, he gets to work with idealist screenwriter, Lee Go Eun (Jung Ryeo-won), who dreams of becoming a top writer someday, and the handsome but arrogant and egoistic hallyu star, Kang Min (Choi Siwon). Currently broadcasting on MBC Channel every Wednesday & Thursday. Already aired 4 Episodes, Total 20 Episodes. 15-year-old Soo-Yeon (Kim So-Hyun) is a victim of bullying at school. They target her, because her father is a murderer. Soo-Yeon has an ally in Jung-Woo (Yeo Jin-Ku), who always protects her from the bullies. Soo-Yeon and Jung-Woo are in love, but due to an unexpected accident they become separated. Now as adults they meet again through destiny. Jung-Woo (Park Yoo-Chun) is now a detective and his first love has always remained in the back of his mind. Soo-Yeon (Yoon Eun-Hye) is now a rookie fashion designer who tries to have a bright personality, but still carries emotional scars inside of her. Hyung-Joon (Yoo Seung-Ho) is Soo-Yeon’s lover, who appears warm and nice, but he will try to take vengeance upon Jung-Woo. Where you can catch the 2 Dramas online? * Fyi, I only watch Drama in Chinese subtitles so the sources given below are all in Chinese subtitles. Usually will update the latest episode the next day after aired in Korea. Only available in Chinese subtitles. Also will update the next day after aired in Korea. But, for King of Dramas you need to catch in fast, they will remove the video fast due to the broadcasting copyright from SBS. The above are the 2 main online sources for my Korean Dramas. There are more online channels like Funsion (http://www.funshion.com/) or Youtube which you can watch too. I prefer King of Dramas than I Miss You. King of Drama story pace is faster and storyline is more reality compared to I Miss You. I Miss You is another tragic love story drama, involve lots of crying and unfortunate scenes which is not my liking. I feel that its a bit draggy especially the first few episodes were all about their stories when they were 15 years old. I have to wait all the way till episode 5 for both Yoo-chun & Eun-hye to appear. I will still continue catching the both dramas, hopefully I have the patience to finish all the episodes. I hope you guys enjoy the 2 dramas as I do!